Ordained out of The Episcopal Diocese of North Carolina, The Rev. David Wantland comes to Houston as a return to Texas. Originally from Dallas, David headed east to study at Furman University in Greenville, South Carolina, where he received a B.A. in French Literature. Those studies took him to some unlikely places, from working in the European Parliament in Brussels to interning at an eco-village micro-finance fund in Dakar, Senegal. Along the way, David became an Episcopalian and received a call to ministry (on a rooftop in the middle of Dakar. Go figure). 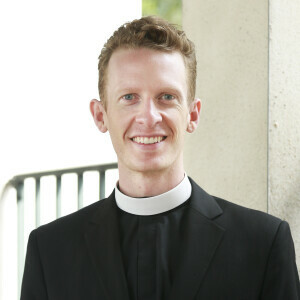 David received his Master of Divinity from Duke University Divinity School and completed a Diploma in Anglican Studies at The Episcopal Seminary of the Southwest before his ordination to the diaconate in North Carolina. David was ordained a priest here at Palmer on Epiphany, 2018. When not at church, David can be found getting lost on a run course, convincing someone to let him garden with them, or trying his legs at ballet. And he’s always looking for an excuse to speak French!